Click the button below to add the MMP-MS4024PAE Pre-Wired Magnum Power Center 4000W 24VDC 120/240VAC to your wish list. About 7 day lead time for pre-wiring and bench testing before shipping. Pre-wired and tested Mini Magnum MS4024PAE Power Center is ready and waiting on our shelves to be shipped out. It comes equipped with a Magnum Energy MS4024PAE 120/240 sinewave inverter, a Mini Magnum Panel pre-assembled with necessary components. They are ETL listed to UL 1741 and CSA C22.2 107-01. 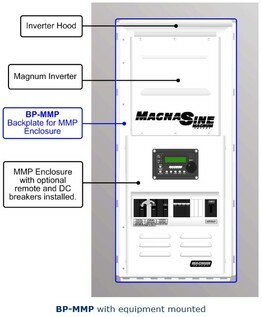 Each MMP includes one DC breaker 250A, One AC bypass breaker – 30A dual pole or 60A single pole, input – 30A dual pole or 60A single pole, a 500A/50mv shunt, DIN rail provided for up to eight DC mini breakers. Ground Fault Protection wired in. 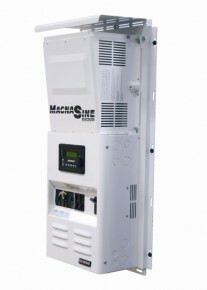 Mini Magnum Power panel parts includes: MS-4024PAE, MMP250-30D, MMP-BP, ME-ARC50, MNDC-GFP63 and 10 foot pair of 4/O CSA approved inverter cable pair.